I was invited to IDS clinic media launch which held back in February 2014 unfortunately i was out of town. 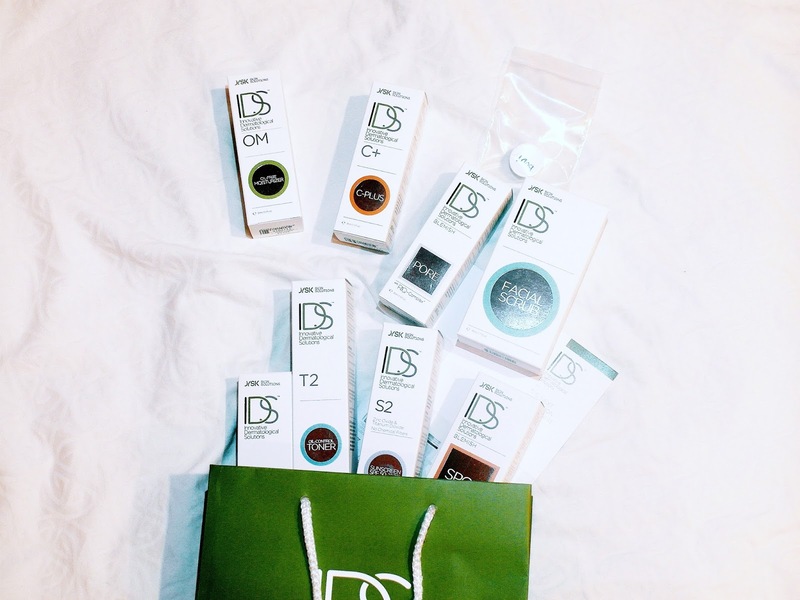 I'm really excited to visit IDS clinic because read many good reviews from both IDS bloggers and patients. I was introduced to Dr SK Tan(He was from D-rx the former owner of DRx and Derma-Rx and now founded IDS clinic) by my lovely friend Naomi. I envy her for her flawless skin and she knew i have acne/pimple problem as a good friend, she really wants to help me achieve flawless skin. You probably heard a lot about IDS from other bloggers. Here is my experience with IDS. When comes to treat skin problems, i will not put myself at risk. After reading through some reviews and got to know that Dr SK Tan is expertise in the treatment of pigmentary conditions (especially melasma) and acne, he is also skilled in other aesthetics procedures and various kinds of lasers. I'm impressed by Dr SK Tan experiences and qualifications. Look at these certifications display outside his office. He is one of the foremost physician in aesthetics cosmeseuticals in Asia. He was a founding member of Derma-Rx and the Medical Director of The DRx Clinic before setting up the IDS Clinic and launching the IDS skincare range of products. His experience includes roles as regional trained in various aesthetic procedures and devices, having trained and mentored numerous doctors locally and overseas. You can read more about him at http://www.idsclinic.com/Doctors. IDS clinic believes in having the right products(if it works well on you) facial is not necessary. Facial can cost a big hole in your wallet. All this while i have been trying on different products but never found one that is suitable for my skin. Most products are too oily for my skin and causes clogged pores. First i was bought to a room to analysis my skin. This helps Dr SK Tan to keep track my skin condition. Consultation with Dr SK Tan. I feel really comfortable talking to him about my skin problem because i know that i could trust him. Not a single doubt! After 20 mins, i was bought to a room to learn more about IDS clinic's skincare range. I was prescribed with some products. A nurse will explain and teach me step by step written down so i will not forget when i got home. I was given 9 products to treat my acne skin. My favourite will be scrub, C+ and non-tinted sunscreen. The facial scrub gets rid of dry patches and leaves you with skin smooth like a baby's bottom. C+ does what it claims, it actually brightens up my pale skin. The non tinted sunscreen is superb, easy to absorb and non sticky. To maintain youthful looking skin, wear sunscreen before you leave the house. Sun ray causes pigmentation and wrinkles and the lists go on. So never ever leave your house without sunscreen. I'm often told that don't put make up when you have breakouts. But it is impossible for me to go to work with my skin like that. My skin improves in week 2 of using their products. However, my skin started to breakouts on week 3 due to menstruation. For women, hormonal changes during the menstrual cycle can trigger an outbreak. :( If you have fair skin like mine, pale skin and acnes, its no fun. After talking to Dr SK Tan he prescribed me a new product. A+ is high in antioxidant, protects and cure problematic skins and also helps to lighten pigmentation. I was told to apply Body(Can be use on both body and face) daily and A+ (3-4 times a week) day and night. Body drys up fresh pimples. 1 month after using IDS products. 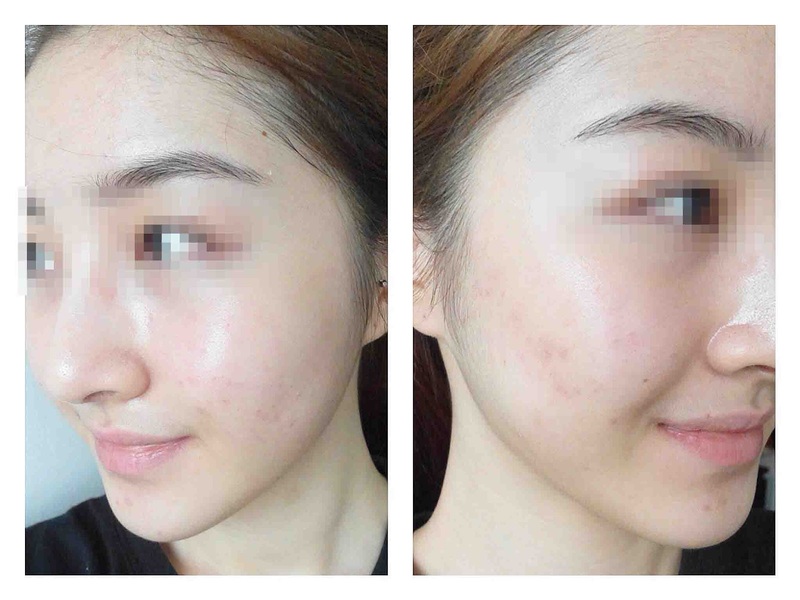 After a month using IDS products intensely, my skin has improve! Now i can attend causal outing without slapping layers of powder onto my skin. With just a thin layer of Non-Tinted Sunscreen and Spot i'm ready to go. Spot acts like a concealer. It covers up and heals the pimples. Minimal effort will get you minimal results.